There is a growing “repair movement” afoot that is empowering people to make their stuff last longer... Read more. Feeling rusty on recycling topics? No problem! Clackamas County staff are hosting a special refresher training on recycling and waste reduction topics, gain confidence and learn how to give group presentations and more. Get inspiration and connect with a Master Recycler mentor. Dates and location aren’t quite set yet, but will be announced in the calendar and upcoming newsletter. To submit a training topic that interests you or for more information contact jgilbertson@clackamas.us or call 503-742-4463. Greener cleaners, pesticides alternatives and non-toxic body care, Metro's Healthy Homes booth is a great way for Master Recyclers talk about health and sustainability. Each year we join in on Metro's campaign and staff booths at county fairs, food harvests, homebuyers fairs and more... Read more. Kelly White (Class 57) is now officially a Master Recycler Centurion. Kelly volunteered 130 hours teaching folks of all ages in Cornelius, Forest Grove and Hillsboro. She started out helping improve sustainability practices at the Forest Grove Community School so hey would become a Certified Green School (her efforts even got covered in The Oregonian -pictured below). She also helped organize Take Care of Cornelius Day and participated in Centro Cultural's Repair Fair. Most recently, Kelly spent a pleasant summer joining the amazing team at the Forest Grove Waste Center at the Farmer's Market. Thank you Kelly for all your wonderful work! Caitlin Ahearn at Nature's Needs - Recology Organics. Caitlin Ahearn is the first person from Class 60 to complete 30 hours of volunteer commitment. Caitlin offered several presentations in Hillsboro and Tigard. She shared simple tips about cleaning without toxics and ideas of how to avoid food waste through the Eat Smart, Waste Less campaign. Mary Healy (Class 57) became a certified Master Recycler doing what she loves to do: teach! A retired school grade teacher, Mary volunteered at Holy Trinity Catholic School teaching kids about the life cycle of stuff. In her innovative presentation, she doled out costumes for kids to demonstrate all of the different players and resources that go into bringing ketchup to the table. She provided this same presentation, along with tips on how to talk to grade school kids, in a presentation to Class 60. Mary Healy (first row on the right) after a presentation to Class 60. Jill Briney (Class 53) focused her 30 hours close to home. She was especially interested in talking to family and neighbors about healthy choices and greener cleaners. For one of her most innovative projects, she made greener cleaner products with special labels to hand out at a baby shower where she explained why it was important to use non-toxic alternatives. She also offered presentations on topics such as greener cleaners and recycling for residents from her condo community. Dena Hastings (Class 46) also completed her hours this month. 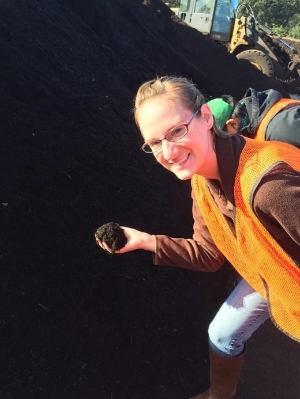 She started out creating instructional handouts for community organizations who checked out the City of Portland’s event recycling and composting equipment. Another project she participated in was through Create Plenty, an organization that works on schools projects that engages high school students in waste recovery and prevention. More opportunities at the Master Recycler Volunteer Calendar. Closes December 23. Visit the Master Recycler Job Board for more information.